EHP's Myristin® softgels are made from cetylated fatty acids oil containing a 40% concentration of cetyl myristoleate (CMO). This 40% strength is the highest of any CMO product in the world. 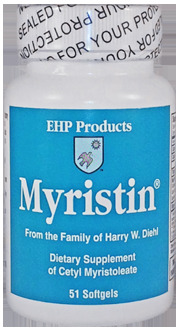 Myristin® is made exclusively in the USA and is gluten-free, non-GMO, and non-allergenic.